Parents: Are Your Children’s Teeth Ready For School? Always remind your children to brush & floss. The school year has just begun and many are thrown into a frenzy trying to make sure they have everything they need for their children to succeed. As dentists we have to ask… was oral hygiene on your list? We’re guessing not, but it’s OK! Image OC Dental, a professional dentist located in Orange County, wants to help ease the transition from summer into school by offering you four sound tips on preparing your oral health as you head back to school. These tips can apply to anyone, but it’s mainly for parents who want the best for their children as they head into the school year. > Don’t forget to schedule an appointment with your dentist some time during the beginning of the school year. This is a great opportunity for your dentist to remove any plaque and tartar that have built up on your child’s teeth over the summer (and we’re guessing a fair amount was built up from all of that ice cream). > Thinking about signing your child up for a sport? Make sure they have an appropriate mouth guard that fits comfortably in their mouth. A generic store bought mouth guard may result in a loose fit that defeats the purpose. Ask your dentist about a custom-made mouth guard. > It’s probably time for a new toothbrush. Selecting a new toothbrush that features a child’s favorite character on it can be very exciting (who would’ve guessed?). The reason we replace our toothbrushes every so often is because over time bacteria builds up on them – something that isn’t good for teeth! 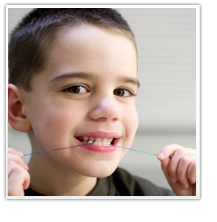 > Let your children know the importance of brushing and flossing. Not only will this save you money in the long term, it will give your children an opportunity to understand why they do the things they are told. We hope these simple back to school dental tips ease the frenzy that is often associated with the new, fall school year. We wish the best to your aspiring children as they enter the new school year!